Whether you asked for a new bicycle for the holidays or you’ve watched your current ride collect dust over the last few months, you know you don’t want winter hibernation to get the best of you and win in the battle against personal fitness gains. Forget the excuses the your new ride isn’t ready for worn tires, you don’t want to clear the bike cobwebs, or it’s too cold, gloomy, snowy, icy, insert-winter-adjective-here to pedal until the ground thaws. We have a solution to break in the new ride, whisk the dust bunnies away and prevent you from feeling sorry for yourself when you’re frustrated over bike splits come spring. And what's even better is that it comes to town right after the holidays are over, meaning even more motivation to stick to those New Year's resolutions that often fall by the wayside just days into January. Meet the latest round of Taste of VQ, the Vision Quest Coaching program designed to let you sample world-class coaching and structured cycling workouts that have seen proven results among past participants. If you've ever wanted to train with a professional cyclist, here's your chance as Vision Quest was founded by Robbie Ventura who once rode with the U.S. Postal Service Team that helped carry Lance Armstrong to a Tour de France win (I hope I'm describing that right). Plus it will help you feel fitter and faster—even besting a few competitors who had the one-up on you before—in the saddle when winter’s over and you’re ready to ride—or race—outside again. You know you're already starting to plot those resolutions after feeling like you've packed on the pounds in the last week. And the timing couldn't be more perfect...this next Taste of VQ session starts on January 3, right after you've watched almost all the bowl games you can handle, eaten the last of the holiday cookies and told yourself your diet starts now. The session runs through the week of February 27 and offers eight sessions of bike training to prep your body for successful cycling come next season, drop a few holiday pounds and take your power levels to new heights. Instead of feeling like you’re trapped indoors, you can be laying the foundation for the upcoming year—and getting a head start on those goals you fell short on last season or what you want to accomplish in the future. 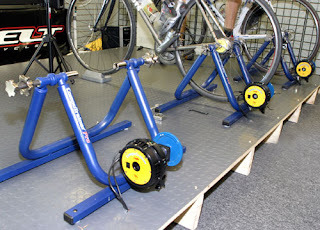 Taste of VQ can help you address your weaknesses and improve your skills while working on cadence and pedaling abilities. You’ll also see plenty of short VO2 intervals with lots of rest and some strength endurance work, which will help you maintain the development level you achieved in the last season while continuing to grow. Once a week, you can come and train using VQ equipment and have access to the staff. This package is perfect if you are unfamiliar with the benefits of a performance center versus a gym, or if you are unsure that structured workouts really make a difference. And at $150 a session, it won't break the bank, especially if you're feeling a little tapped dry from the holidays. To learn more and to sign up, check out visionquestcoaching.com. Then prepare to be pushed to your limits and beyond.